Ice cream these days is all about experimentation, but San Francisco plays host to a number of classic ice cream companies, as well. Businesses are branching out from more traditional flavors that echo warm childhood summers into more unchartered territory. The result? Satisfaction of the distinct appetites that define this very diverse city we call home. Check out a few of our favorite new and old school ice cream joints. 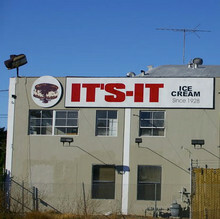 Just a half hour drive from downtown San Francisco sits the It’s It factory, a fixture of San Francisco’s dessert scene. Drivers may easily miss the nondescript building just off Highway 101 that is home to the dessert that started in 1928 with a simple scoop of vanilla ice cream sandwiched between two oatmeal cookies and coated in dark chocolate. George Whitney, general manager of oceanfront amusement park, Playland-at-the-Beach, near Ocean Beach, introduced It’s It to park patrons. The dessert could only be purchase at the park until it was shuttered in 1972 and distribution was expanded to local markets. It’s It diversified its selection, introducing ice cream sandwiches with chocolate, mint, and cappuccino filling. Despite popular demand, the factory does not offer tours, so you will have to settle for the website’s virtual tour. In these times of bacon-flavored ice cream, it is heartwarming to know that customers still demand simple desserts laced in San Francisco tradition. Two decades after the It’s It was introduced to the palettes of San Franciscans, another ice cream staple was introduced with the opening of Swensen’s Ice Cream Store on Union Street and Hyde Street. The store is still there today and on any given evening — despite the San Francisco chill — you can expect a crowd of patrons ready to satisfy their craving for ice cream by the scoop. Chances are you’ve seen the crowds parked outside a small, brightly lit shop out on San Jose and 29th street. Since 1953, the Mitchell’s brothers has attracted teems of sweet-toothed fans to the Mission District shop where they make all ice cream in-house with the help of a large batch freezer. Mitchell’s tempts stomachs with traditionally inspired flavors like Grasshopper Pie, a mix of mint chocolate chip ice cream, fudge, and Oreos, and then intrigues more adventurous spirits with hits like South American favorite, Lucuma, and the Filipino dark purple yam flavor, Ube. Relatively new to San Francisco, La Copa Loca opened in 2005. It’s name translates to “the crazy cup,” which may describe your mental state after discovering the hole-in-the-wall gelateria that serves up some of the most authentic and creative gelato and sorbet in SF. 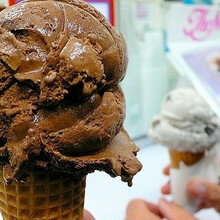 Italian Owner, Mauro Pislor, is a former chef who retired his knives in favor of a gelato scooper. After studying the craft in Italy and Germany, Mauro returned to open La Copa Loca. Mauro tried to adapt to the American love of ice cream but in his heart he missed the two to three daily gelatos he would devour in the Dolomites region of Italy. The menu is more fruit-centric but has its share of chocolate, caramel or peanut-butter inspired flavors. La Copa Loca focuses on fresh, quality ingredients. Mauro imports pistachios from Italy for his pistachio-flavored gelato and heads to the Filipino shop around the corner to buy fresh yellow dragon fruit for his sorbet. San Francisco foodies flock to the inventive ice cream flavors showcased at Humphry Slocombe, one of the most highly acclaimed ice cream joints of the hour. 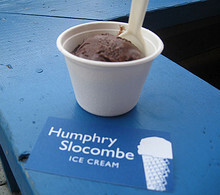 Humphry Slocombe laughs in the face of tradition. The daily menu includes ten, or more, options selected from more than one hundred ice creams made in-house with the on-site ice cream spinner and super cold blast freezer. The decadent assortment includes everything from Secret Breakfast (bourbon flavored ice cream with cornflakes) to Jesus Juice Sorbet (a red wine and Coke mix that is a legitimate alternative to the dive bar favorite) to Foie Gras (local vegans are crying everywhere). The shop also pays homage to local businesses with flavors like Blue Bottle Vietnamese Coffee and Boccalone Prosciutto. The taste spoke to my carnivorous tendencies with the essence of sliced salty pork balanced harmoniously by simple cream. Slocombe steams the pork bones in the ice cream base, contributing to the fatty, meaty undertones.